Pages: 256; Dimensions: 6" x 9" x 1/2" Weight: 1 lb. Built on Richard Paul's model of critical thinking, Learning to Think Things Through, was written to help students engage in critical thinking within the discipline or subject matter they are studying. 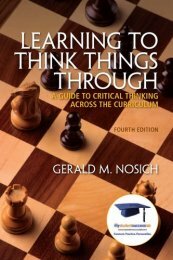 105B Learning to Think Things Through: A Guide to Critical Thinking Across the Curriculum $59.99	 Qty. Since the mid–1980s, Gerald Nosich has been committed to teaching critical thinking across the curriculum and throughout the disciplines. He believes that, in the final analysis, the only way for students to master content in any course is to think their way through it. And the only way to effectively control their own lives and choices is by learning to think more critically about them. Built on Richard Paul’s model of critical thinking, Learning to Think Things Through was written to help students engage in critical thinking within the discipline or subject matter they are studying. In addition, students will better appreciate the power of the discipline they are studying, see its connections to other fields and to their day-to-day lives, maintain an overview of the field so they can see the parts in terms of the whole, and become active learners, rather than passive recipients of information. Learning to Think Things Through is ideal for instructors addressing the critical thinking component in composition courses, sciences, humanities, the professions—in any field.